This wonderful variety of Daffodil is a sight to behold in March, thanks to the wonderful contrasting flowers. The long orange trumpets contrast beautifully against the golden perianth segments. 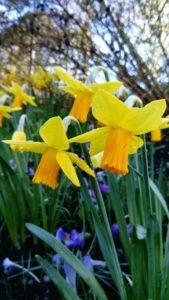 Narcissus ‘Jet Fire’ tends to stand at 20cm tall, which means it is less likely to be broken by strong winds like some of the taller hybrids. This particular cultivar is happy planted in borders, containers and in grass. But do remember to plant them at least two to three times their own depth in the ground for best flowering results. This stops them coming up blind (not producing flowers). Narcissi bulbs need to be in the ground early in the bulb-planting season; late August or early September is the optimal time. Once Narcissi have finished flowering, do not be tempted to cut back the foliage until it has died back. The leaves produce nutrients that are sent down in to the bulb for next year’s growth and flower production. Similarly, tying the leaves up into neat bundles stops this process happening. To keep your Daffodil’s healthy, use a high-potassium fertiliser after flowering as this will also help with flower production for next year.